Montrell Jackson (left), Brad Garafola (center) and Matthew Gerald (right) were shot and killed in Baton Rouge, Louisiana, on Sunday, July 17, 2016. BATON ROUGE, La. 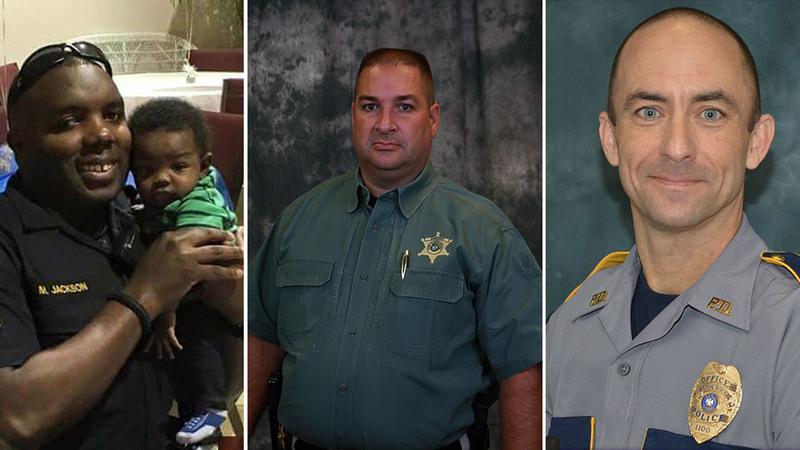 (KABC) -- Authorities have released the identities of the three law enforcement officers shot and killed in Baton Rouge, Louisiana, on Sunday. Brad Garafola: The 45-year-old deputy had been serving with the East Baton Rouge Sheriff's Office for 24 years. Brad Garafola, 45, was shot and killed in Baton Rouge, Louisiana, on Sunday, July 17, 2016. The sheriff's office said Garafola was currently working in civil processing-foreclosures. A neighbor described Garafola as a "family man," and said he leaves behind a 7-year-old girl, a 12-year-old son, a 15-year-old daughter and a 21-year-old son. Matthew Gerald: The 41-year-old officer had been serving with the Baton Rouge Police Department for less than a year. Matthew Gerald, 41, was shot and killed in Baton Rouge, Louisiana, on Sunday, July 17, 2016. Gerald was currently assigned to the uniform patrol bureau. He had celebrated his fourth wedding anniversary just two weeks ago. WWL-TV in New Orleans reported Gerald and his wife, Dechia, have a 3-year-old daughter together and that Gerald had adopted his wife's daughter from a previous relationship. A family friend described him as, "a good family man, good cop, loving husband." Montrell Jackson: The 32-year-old officer had been serving with the Baton Rouge Police Department for 10 years. Montrell Jackson, 32, was shot and killed in Baton Rouge, Louisiana, on Sunday, July 17, 2016. Jackson was currently assigned to the uniform patrol bureau. He leaves behind a 4-month-old son, Mason, and his wife Trenisha Jackson. Just days before his death, he took to Facebook in a touching post to discuss the hardships he'd recently faced as an officer. He ended the post by stating, "I'm working these streets so any protesters, officers, friends, family or whoever, if you see me and need a hug or want to say a prayer, I got you."